Toys have a way of taking over the house. Stuffed animals breed in closets. You give birth to one sweet little baby and the next thing you know there are toys, toys, everywhere! Over the years I have tried so many ways to take the toy clutter and make our house look like a home instead of like the local toy store. The result was always the same. I would spend a couple of hours during naptime organizing and it would look really great for a short while, but soon we were back to a big old toy mess. Ladies and Gentleman, may I present my solution? [insert drum roll here!] Here’s the toy system we’ve been using for a few months now (and it’s working great)! First I did something dramatic. I got rid of about 80% of the toys in our house. Anything broken or so cheap it would break soon got tossed. Many of the stuffed animals that came from who-knows-where got donated to our local police station. (The police keep one or two in their trunks and then pass them out to children they meet in the line of duty who need a bit of comfort.) Then, keeping in mind the old adage that “Good is enemy of the Best”, I sorted through the remaining toys and kept only the toys that I thought were the most beneficial. If I wasn’t sure whether or not a toy would be missed, I put it in a box in the shed where I could easily retrieve it if one of the children asked for it. Next, I made a resolution to not buy new toys for my children. Before you gasp in horror, I promise you… there is no shortage of children’s toys in the world! Toys will find their way into your home without your help through grandparents and well-meaning friends and neighbors! What I mean by this is that we don’t just buy a toy if we happen to be running out to the dollar store. Toys are pre-planned purchases made after careful consideration of whether or not this particular toy adds value to our lives. The next step was to sort the remaining toys into bins (purchased inexpensively at Walmart) with lids. The lids are key to this system! Lids keep everything separate. Without lids, the toys will be a jumbled mess again in no time! 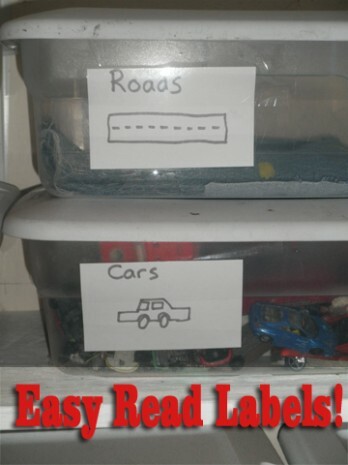 I also made labels out of index cards for each bin that included a word for the children to read and a very simple line drawing to remind anyone putting toys away which toy goes where. The beauty of labels that that even if your children know where the toys go, the labels make it obvious to anyone helping out! So toys always get put away into the correct bin! Finally, one last rule: One bin at a time! There are a few exceptions to this rule: The cars and roads get played with together, the train tracks and train accessories get played with together. Also, when my daughter wants to play with dolls and the younger boys really want to play with something else, then I allow two bins to come off the shelf at once. The Bedrooms stay clean because there are no toys in there! The children can easily see what toys they have and since everything is organized, they don’t get frustrated looking for a particular toy that could be “anywhere”! Toys always get put away into the correct bin! Clean-up only takes a minute and everything stays orderly! I am loving this new toy system of ours! Do you have suggestions for keeping the toy-clutter at bay? Ive been thinking of doing something similar! So nice to see it “in action” before going through with it. I’m Curiousabout what you will say about not playing in the bedroom. 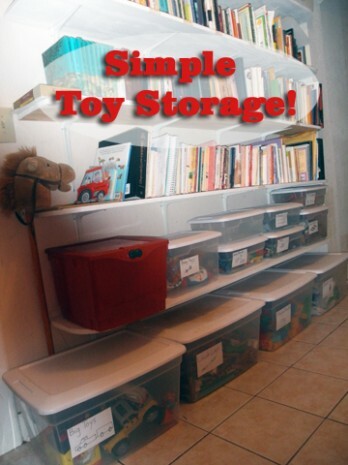 With so little space in our home, I WANT toys to stay in their room, otherwise…. There’s the middle of the living room floor… Or under the kitchen table 🙂 we have no where else. THANKS! i’ll check it out…. 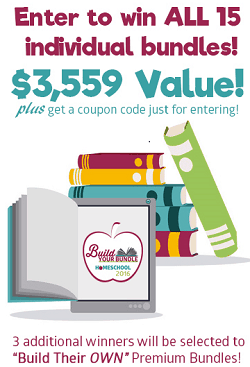 gearing up for a BIG cleaning/organizing/purging week as soon as school is out for the summer 🙂 let’s just say, I am praying to have less of a bunch of stuff… and whatever stays will have its own HOME!!! I’m curious as to what different toys you kept vs. what you got rid of. What categories do you have? How much of each? We are in the process of simplifying, as well, but choosing what goes and what stays is my hang up. We are home a lot and homeschool so having toys really is my children’s source of entertainment and learning. That combined with my daughter wanting girly things and my guys wanting boyish things has me hung up with indecision. But a lot of it has to go as it stays way too chaotic for our growing family! Well, Kelli, the first thing I did was sort through the toys and get rid of anything that was broken or missing pieces. They weren’t able to play with these toys anyway, and so they were just taking up space. Then I just started putting the remaining toys in piles or bins. If toys didn’t fit together then I considered whether or not we should keep it. After all, a toy might be a good toy, but if it doesn’t have a home then it’s not going to help teach the children about orderliness… and I would rather that they have good habits and good characters than lots of toys! The red bin that you see in the picture is our “Sabbath Toys” Box. In that box there are special toys that relate to the Bible… A discarded nativity set, homemade felt Bible puppets, Bible Games etc. They are allowed to only play with these toys on Sabbath and it helps them come apart from the world on that one day and keep their minds on God. The labels really help! I’ve been amazed at how stuff stays organized. My artwork is not exactly spectacular, but it does the job! Even our littlest visitors can see where things belong! This is what I did when my children were growing up. People were amazed that I had 4 boys in one bedroom. But if all they do is sleep and dress in there, no problem! They would sometimes read in their room, too, but the toys were kept elsewhere in bins with labels. We kept the ‘good’ toys. The classic toys like Brio trains, and legos, and lincoln logs, etc. Or some toys the children really enjoyed playing with like the Fisher Price people toys- the pirate ship, the tree house, the old west set, etc. The girls had their girly toys, too. To me, the ‘good’ toys are the ones that require some imagination and get hours of play. I disagree with no toys in the bedroom. We live in a small place, and the only place to put the kids’ toys is on an Expedit (Ikea) Shelf Unit that is in the kids’ bedroom. I have, though, trained my kids to only take out one bin/kind of toy from the shelf at a time.